In the Merriam-Webster Dictionary, fit out is a verb which means to supply with necessaries or means. However, this term is also defined as designing and completing a shell space – a raw floor space bounded by walls – with the specific interior partitioning, floor, ceiling, mechanical, electrical, and environmental requirements of its occupants included, according to the University of Colorado. In an establishment, especially for a working environment, the proper installment of interior spaces plays a huge role which impacts its occupants. In this case, a fit out construction service can handle the responsibility along with the occupants’ plan and try to pull out the best outcome of a well-functioning working space. It’s only appropriate to seek the help of fit out contractors in the Philippines to provide excellent and convenient construction services for clients in the business industry like BPOs and Call Centers, IT Solutions and more. For the project to run smoothly from its planning until the finishing touch, take a look at this breakdown of the step-by-step procedure to further guide you in working with a good fit out company. Tasks involved in the pre-construction stage serve as the foundation of a successful construction project. The primary aim of this stage is to provide a reliable, complete, and accurate source of information for both the establishment owner and the service provider. Such information gives way for the project team to make precise decisions on schedule, cost, and quality of the services. To understand the limitations of the project, these procedures in pre-construction will help in carrying out realistic schedules, costing, and planned structures of the property. Processes included in these procedures are site monitoring, waste management, review of existing facilities and site components, and study of building guidelines. This is to ensure that the project will be potentially safe and will be a successful vision before any work starts. Here, design and space planning will also take place. As the design catches people’s attention most, pay attention on its development as it’s one of the greatest opportunities to influence and please the occupants of the establishment. Spaces should be properly divided and arranged for functional elements. Design coordination meetings together with consultants are done in this phase, with experts studying and evaluating the plan’s feasibility on the project. There is also optimization of time and budget along the process as more specifications are made through these meetings. 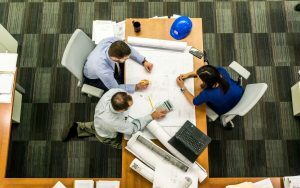 To prevent loss of money, overpaying, cost overruns, and failing to complete the project, both the project team and the clients should carefully consider estimating the possible fit out construction cost. These calculations are used to determine the project scope and feasibility within the available budget. Contractors also use them as bases when deciding to bid the project. Commissioning, determining requirements, design team formation, design, bidding, and contract signing are some of the processes included in these activities. To proceed with the construction process, mandatory permits and licenses are also needed. The requirements usually include building licenses, plumbing, electrical, water usage, fire management, and safety permits and many more. This is the stage in construction where the actual work will take place. A detailed program provided by the contractor is needed as it contains all time-frames for each process, as well as the approvals. Regular meetings can also be conducted to ensure a clear communication among all parties regarding the condition of the construction process. Site progress, design perspective issues, including health, safety, and other concerns will be discussed during these meet-ups to make sure that everything is going well. The works of fit out contractors in this phase include electrical, mechanical, cabling, plumbing, drainage, as well as sanitary and fire safety services. While the construction is on progress, appointed staff will engage in frequent monitoring to ensure the project will reach completion on time. Finally, the last step of fit out construction is known as the handover or practical completion. This only means that the space is available and ready to be used by the occupants. Aside from the finishing touches, there must be a final inspection to settle the overall look and condition of the constructed project. The fit out company, along with the appointed project manager or coordinator, shall provide minimal but sufficient information about the project such as signed and sealed as-built drawings, snagging issues (if any), final payment fixes, warranty reviews, and operating manuals to provide instructions for the client. Occupancy permits, all testing and commissioning reports, final electrical inspection, and fire safety inspection certificates must be submitted both by the lessee and his contractor. There are final fixes on the payment processes, including charges on any changes made during construction, utility charges, administrative fees, and all other unpaid accounts that should be settled as soon as construction is complete and before its schedule for utilization. Ellcad Premiere Construction Corporation is a trusted fit out contractor in the Philippines which aims to be a recognizable and leading contractor across the nation because of its wide and excellent scope of fit out products and construction services. The company also wishes to establish a strong relationship with its clients through providing an efficient and flexible management. Surveying the site of available facilities and evaluating the existing site condition. In this stage, insights and suggestions will be provided to ensure that the design and space organization are efficient for the workflow, especially for office relocation basics such as gang chairs, freestanding tables, solid surfaces and more. After the design is finalized, Ellcad will provide an estimate of the quantity and cost of materials, equipment, and manpower to be used, including the contracts and schedules. In this process, Ellcad will work on the necessary building authorizations and documentations to make sure there is a free-flowing construction on the designated area. Toolbox meetings and construction coordination meetings are conducted to ensure proper workflow and execution. After completing the safety measures, mobilization takes place – workers, tools, and materials to be used are moved to the project site to start the construction process. This process includes installation of architectural interiors such as wall and enclosure works, ceiling works, flooring works, and accent systems. Included here are supplying and installing series of electrical components such as convenience outlets, lighting fixtures, as well as other electrical configuration. This includes relocation of existing air cooling units, supplying and installing air cooling units and other mechanical configuration and auxiliary. Includes supply and installation of IT components and configurations such as voice and data nodes, Wi-Fi access, and equipment terminations. Supply of water line, drain line, and vent line for wet points. Includes auxiliary works on fire detection and alarm system, and fire protection works. The application of supplementary works related to main trades which will support the operations of the offices happens in this step. Covers accessorizing of establishment to an acceptable and usable work environment, and includes procedures such as interior design specifications, providing a workspace for client’s branding, architectural interiors, and supply of furniture and accent pieces as per client’s preference. Occupancy permits and final documents are managed. Surveys are made to identify and record the various aspects of the completed building, for future reference as well as comparison with the original designs. Testing and commissioning is a dry-run of the office operations to check for possible flaws, especially of installed equipment and components. This is to ensure a proper functioning office space prior to turnover. This is the phase where the project is transferred to the operations and maintenance team as a wrap up on the construction work and to make it available for occupant utilization. One year service warranty is given to the client. Installation and repair of a working establishment is an important change for a company. With the economic changes in the business industry, offices must be able to catch up with necessary equipment and continuous development regarding work activities. Collaborate with a fit out contractor today in turning a magnificent working space interior into reality!